The second-thickest stainless steel wire rope we offer in this construction measures 50mm in diameter and retains the choice of two cores shared by its stable mates. Order today and enjoy safe lifting of loads weighing up to 142 tonnes form the 50mm 6×36 Stainless Steel Wire Rope . 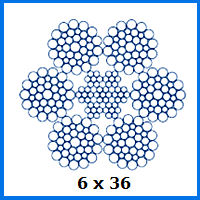 What are the benefits of 50mm 6×36 Stainless Steel Wire Rope ? Wire rope made from stainless steel will not rust or corrode when rainwater, seawater or any other atmospheric substances come in contact with its surface. This makes the primary reason to choose this 6×36 stainless steel rope that of resilience. Another advantage it offers is aesthetic appeal; the surface will shimmer in the light and turn heads wherever it is displayed. The final selling point of this particular rope worth mentioning is the choice of cores. Opt for a sturdier, more rigid steel wire core, or pick the lighter fibre core. Whichever you choose, Rope Services Direct will supply you with as much as you need. This is something we offer all customers, so if you want to get your wire rope delivered with appropriate fittings already installed, just ask us. We stock shackles, end terminals and a bevy of other important products that might prove valuable to your lifting operations. You can email RSD or give our sales team a call on 01384 78004 when you want to order 6×36 stainless steel wire rope of any diameter. We can also answer questions and serve up bespoke quotes for any customers who contact us. 50mm 6x36 Stainless Steel Wire Rope Overall rating: 5 out of 5 based on 6 reviews.